“Everything we have, everything we do, is because of what they have done for us.” Ryan Suter. In the days leading up to November 11, the date on which members of the armed forces, past and present, are acknowledged around the world, Suter, along with many of his NHL brethren, took pause to honour those who died in the line of duty and recognize those who served and serve their countries. Suter’s heartfelt words are a poignant reminder of the relationship between the military and several NHL players, a list that includes Joffrey Lupul, Luke Schenn, Ryan Kesler, Brent Burns, David Backes, Josh Harding, James van Riemsdyk, Zach Parise, George Parros and Eric Boulton. Suter was reminded of that when he met a Medal of Honor (the United States highest military honor, awarded for personal acts of valor above and beyond the call of duty) recipient. Matt Hendricks, who has played in over 275 NHL regular season games, and is in his first season with Nashville, is a huge supporter of the military. In 2012, he received an invitation to be part of the USO Holiday Tour, an event that brings singers, actors, actresses, comedians, athletes and others overseas to visit the troops. Hendricks’ trip included visits in Bahrain, Kyrgyzstan, and Kandahar airfields in Afghanistan and two stops in Germany. There have also been countless contributions from players that don’t always grab the headlines. When Shane Hudella, who founded Defending The Blue Line in 2009, recently reached out to Paul Martin for some assistance, the Pittsburgh defenceman went far and above what he anticipated. There will be another such scene on Monday in Minnesota, courtesy of the NHLPA’s Goals & Dreams fund. Players from the Minnesota Wild will participate in an outdoor hockey clinic for 50 special military children at the Guidant John Rose Oval in Roseville. Goals & Dreams will donate 25 sets of brand new hockey equipment to the military youth supported by Defending The Blue Line. Goals & Dreams has donated 300 complete sets of gear to the organization over the last three years. “This exemplifies everything the players mean to our organization,” offered Hudella. “Not only spending quality one on one time with the kids to give them that star-power experience and personal encouragement, but also the extreme generosity on the back end by donating the gear to these little heroes. Equipment is the lifeblood of hockey for these youth, and through the enormous gift of the Goals & Dreams donation, we're able to outfit military kids here in Minnesota, and all across North America." 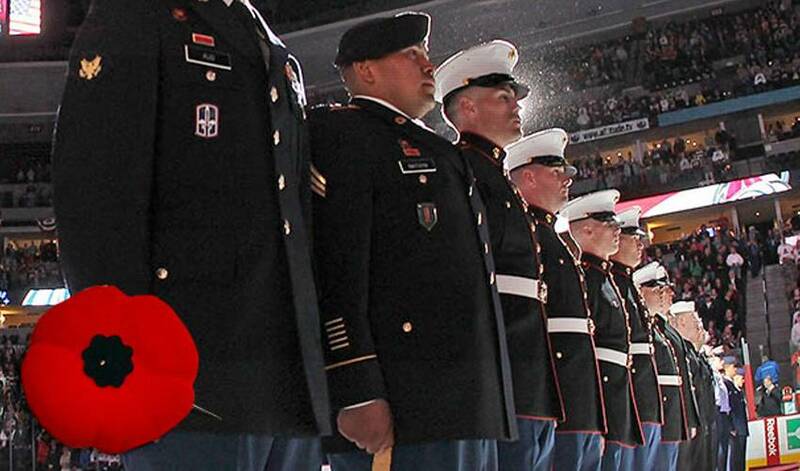 It’s one more reason to put a smile on the faces of the players who support the military. It was 22 years ago when Matt Hendricks started a part-time job, one that would shape the way he played hockey at the big-league level. NHL Players like Brent Burns, Charlie Coyle, Matt Hendricks & Nate Schmidt talk about their respect and admiration for the people who protect our freedom.